The sacred city of Muslims, Ajmer, which is famous for Dargah-e-Sharif is a must visit place in the country. You can plan a road trip from Jaipur to Ajmer during the festival of Urs and experience a sight to look at. The Tixilo car rental service providers offer one way cab services at quite affordable rates, so that your journey to this holy city is not only comfortable and free of trouble, but also is safe and secure. Why a Tixilo hot one way from Jaipur to Ajmer? The total distance between Jaipur to Ajmer is 130 kms, and can be covered within 2 hours approximately. You can easily book a Tixilo cab of your choice at our website or from our Tixilo mobile app. Your comfort is our motive and we will try to make your one way trip from Jaipur to Ajmer as convenient as possible. We offer a one-time pick up from anywhere in Jaipur and one time drop to any location in Ajmer at very affordable rates. Booking a Tixilo cab is quite easy. Simply log into our Tixilo website, provide information about the pick-up and drop down location. Select the cab type from a fleet of cabs ranging from Sedans and SUVs to luxurious cabs like Audi and Mercedes. After you are done a confirmation email and a message will be sent to the contact that you provide confirming your booking. A quality one way taxi service is provided on the route from Jaipur to Ajmer. We offer the following advantages to our consumers. · Clean and well maintained cabs ensuring a comfortable and safe ride. · GPS and WiFi enabled. 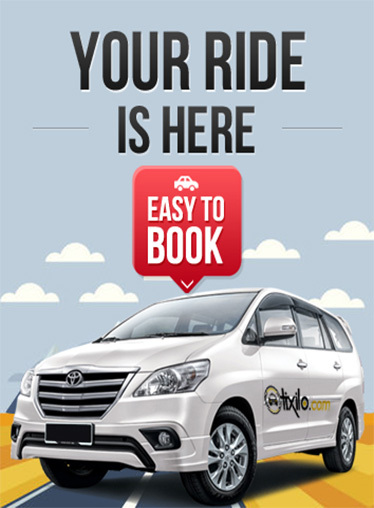 · Book a taxi online easily via mobile app or website. · Large fleet of taxis to choose from. · Well-organized cab rental network.